Participants of the Level 3 National Coaching Certification Programme (NCCP) clinic were awarded certificates at a graduation ceremony held at the Barbados Olympic Association Inc. (BOA) headquarters in Wildey on Monday. 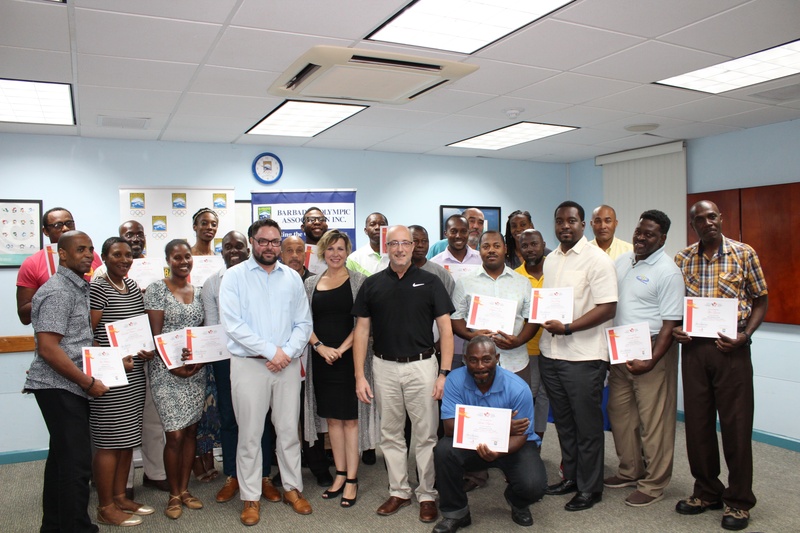 The 30 coaches, who participated in the seven-month training programme, received training aimed at providing them with the theoretical knowledge of sport science to help boost the level of coaching in Barbados, and improve the long-term performance of athletes. President Sandra Osborne in her address, thanked the Coaching Association of Canada and praised the programme sponsored through the Olympic Solidarity’s Development of National Sport Structure Initiative. “The achievement of the Level 3 certification marks a significant stepping stone in the BOA’s quest to improve the level of coaching and by extension, the quality of athlete development in Barbados,” Osborne said. Coaching Association of Canada CEO, Lorraine Lafreniere, who also presented some of the certificates, said that she recognised the island’s leadership in understanding the importance of coaching education and development, praising Barbados for being ahead of the curve on coaching education. Lafreniere said that she cherished the relationship between the Coaching Association of Canada and the BOA and would love to continue the partnership to help each other grow to become better. Ian Weithers, who received a certificate for completing the programme, said it was a great learning opportunity which allowed him to validate areas around his coaching and gave him a new perspective in other areas. This Coach Education Programme, delivered through a series of coaching clinics, was initiated by the BOA in collaboration with the Coaching Association of Canada and Olympic Solidarity in 2015. It is conducted by Canadian instructors. The programme targets local coaches of national federations, sport associations and primary and secondary schools. To date, more than 200 coaches have been trained to Level 1 and 100 trained to Level 2 of the NCCP – the basis of coach education and training in Canada.